Norman is a sensitive and touching portrait of a good man who simply wants to matter. 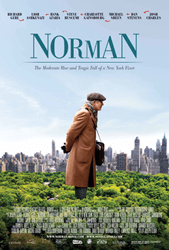 The full title of this subtle and thoughtful film says it all: Norman: The Moderate Rise and Tragic Fall of a New York Fixer. Richard Gere used to appear in big Hollywood films before he took a stand against China’s treatment of Tibet. Now, with China a significant source of financing and one of the world’s largest film markets, opportunities for Mr. Gere are not as plentiful. Thankfully, artists have the impulse to create, and without any paths into Hollywood films, Gere is open to indies at a time when he is at the top of his game. In Norman, Gere plays the titular character, a man who seeks to serve his community by connecting the right people together. The problem is, he himself has little to offer other than his networking abilities. He stalks potential contacts, meticulously planning the grand ideas and stories he can tell them as he tries to make his way into their life. But when he approaches them, chattering away about who their mutual friends are and who they should meet, he’s shunned as a pest. One fateful day, fortune shines on Norman when he has the opportunity to serve an important man in a moment of vulnerability. They strike up an unexpected friendship, but soon it’s clear that scandal and tragedy are inevitable.